Colorful Visions At African-American Art Exhibit For three decades, the Smithsonian Institution has been collecting work by African-American artists, work that is now on display at the American Art Museum in Washington, D.C. The exhibition offers a wide-ranging and colorful view of African-American life. The African-American experience is reflected, right now, on the walls of the Smithsonian American Art Museum in Washington, D.C. Exuberant dancing in Chicago. Laundry on a line in the nation's capital. A girl smiling out from her father's warm jacket — all captured in photographs, paintings and sculptures from the 1920s through the 1990s. The show is called "African-American Art: Harlem Renaissance, Civil Rights Era and Beyond." And there is a question: Does it segregate — or at the very least compartmentalize — African-American artists? Yes, says exhibition consultant Renee Ater, an art historian at the University of Maryland. 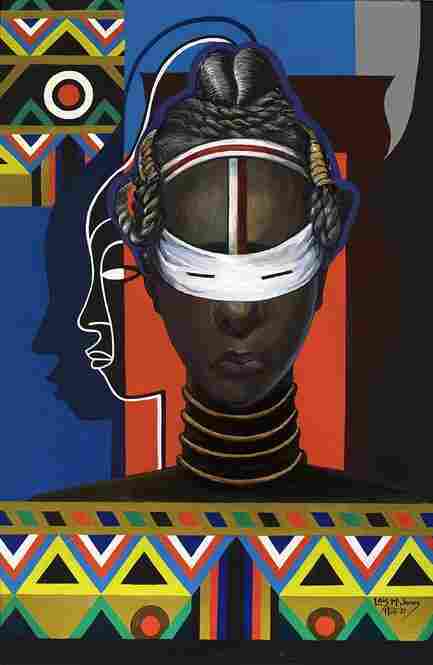 But, she says, it also shows African-Americans involved in visual conversations that have absorbed artists of all races. "They're concerted with color, they're concerned with line, they're concerned with form, and that's one of the things that you see in the show," Ater says. "And the other thing about this exhibition is that you see African-American faces looking out at you." But those faces are still a rare sight on the walls of a 21st-century museum. 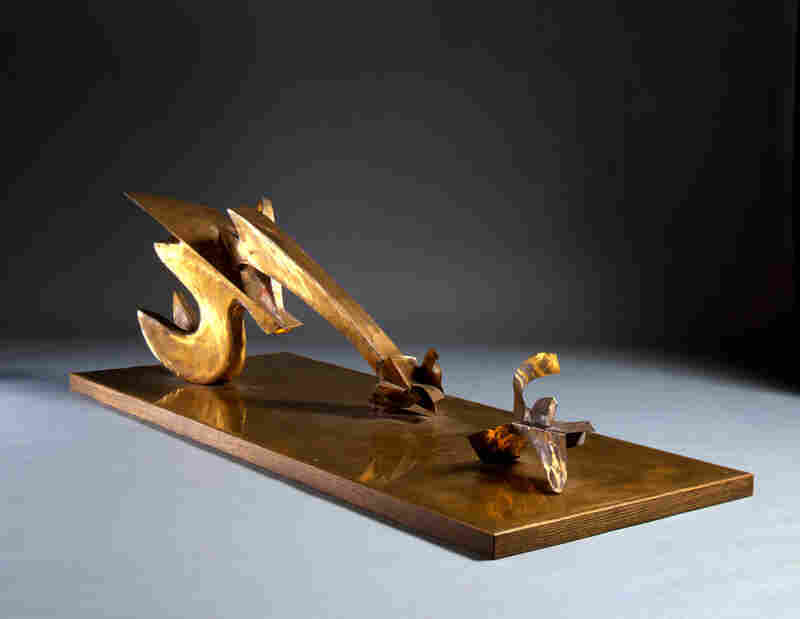 A story about one of the artists in the show — Lois Mailou Jones — underscores the point. Jones studied painting in Paris and Boston, taught at Howard University, had a firm reputation. But curator Virginia Mecklenburg says that back in the 1930s, when Jones wanted to submit her work to a show, she would send it anonymously, through an art shipper. "She was fairly convinced, and rightly so, that if whatever museum was receiving the painting knew that it was painted by a black woman, that it would probably have very little chance of getting on the walls," Mecklenburg says. Now, the walls of the American Art Museum are full of 100 works by 43 African-Americans, the result of three decades of collecting by the Smithsonian. The museum claims the largest collection of African-American art in the world — a critical mass that prompts this exhibit. There are actually more photographs than paintings in the show — powerful black and white images shot in places like Baltimore, Houston, Norfolk and 170th Street in the Bronx. That last photo, taken by Robert McNeill in 1938, is called "Make a Wish," the title of a movie poster hanging in the corner of the photo. The image, subtitled "Bronx Slave Market," shows a man in a cap and beat-up leather jacket, and two women, wrapped in worn, fur-trimmed coats against the sunny cold. All three are looking for daywork — cleaning, or hauling. It's a photograph about patience, endurance and hope. "They never knew if they were going to get work," says curator Mecklenburg. "They just sat there and waited." And that hopeful lineup remains familiar. "You see it in Home Depot parking lots, as men who are waiting for day labor, for construction work, for gardening, lawn work." Farm labor — the kind that reaps sweat and aches along with the crops — is painter Benny Andrews' subject in "The Long Rows." Made in 1966, it's Andrew's memory of his share-cropper parents, hoeing the red Georgia earth on a hot summer day. It's hard to tell who the painting really depicts — all that's visible is a broad back and backside over bare legs, and a hoe held to the earth in a pose that elicits sympathetic aches in the viewer. "We don't actually know if it's a man or a woman, hoeing a row of cotton," says Betsy Broun, director of the American Art Museum. "But this figure looks like an outdoor monument or sculpture, so massive. And suddenly we realize that the perspective we're getting is that of a small child trailing behind." 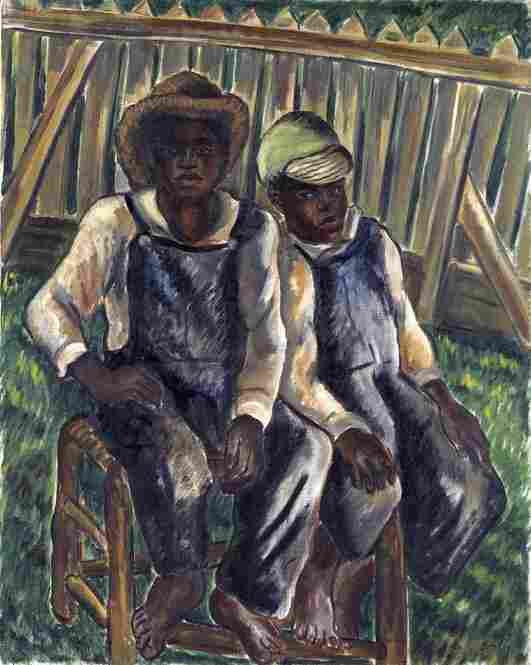 On a nearby wall hangs an image of two little boys who also could have been working in that field: Malvin Gray Johnson's 1934 painting "Brothers." The boys are barefoot in sun hats and overalls, and their hands look big for their ages — they seem to be around 8 or 10 years old. Virginia Mecklenburg says she loves the way one brother leans against the other, "as his older brother is the protector ... someone who will care for the younger sibling." And in its time, the painting was quite unusual. "Johnson actually did this while he was working for something called the Public Works of Art project, which was a government sponsored program that allowed artists to paint whatever it was that they chose to paint," she says. 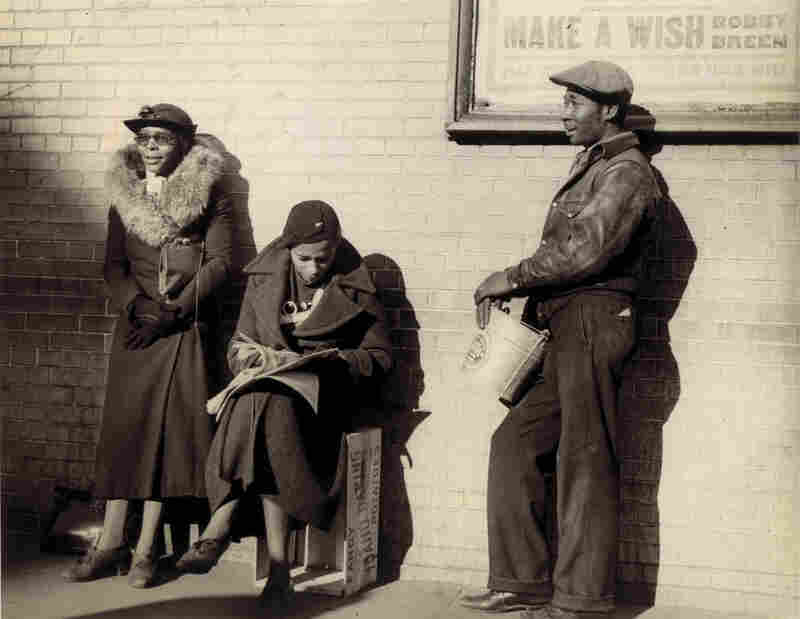 "Scenes of little black boys sitting in a yard would not have had any market, certainly not in New York in the 1930s, but because of this federal program, Johnson could paint things he thought were important for us to see." 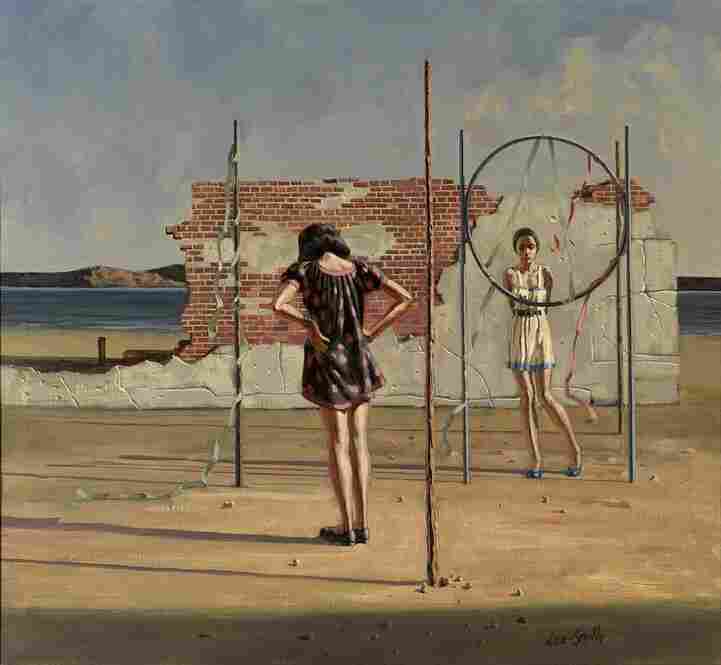 Another featured artist, Hughie Lee Smith, shows us a more contemporary image of two young people — girls with the long skinny legs of adolescence. His 1970 painting is full of tension. Museum director Betsy Broun says the work's title, "Confrontation," is both clear and mysterious. "They're both standing somewhat separated, somewhat apart, and they're in a landscape that's a little hard to understand," Broun says. "It appears to have a ruined wall behind them, a brick wall. Beyond that you have a glimpse of the water of the ocean. It has a feeling of desolation." Broun adds that she thinks Hughie Lee Smith may be the great poet of alienation. "He is able to convey the thwarted lives of growing up in a society where the full opportunity is not open to you," she says. "And I think this was really important after World War II and even before the civil rights movement and after, to convey that, that sense of what it means to be an African-American adolescent, ready to move ahead with your life but feeling you're lost in a ruined landscape in some way." The exhibition remains at the Smithsonian American Art Museum through early September, then travels to seven other museums in the U.S. It offers a wide, colorful range of visions — tense, hopeful, optimistic and abstract. Plus a stunning catalog.